Yes, yes. Another asparagus recipe. 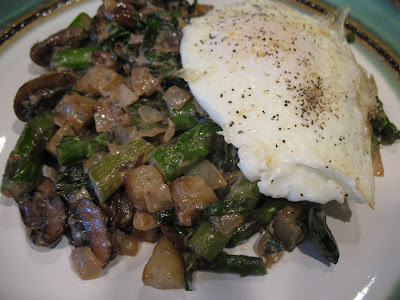 Earlier this year, the Washington Post did a whole article on hash and included recipes for this vegetarian mushroom asparagus hash, a sweet potato andouille hash and a traditional corned beef hash. I think Mom has tried the sweet potato hash recipe... Mom? This one was fine, but a lot of effort. 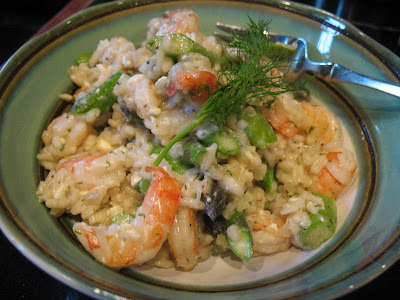 I like last night's risotto much better as far as asparagus goes. But the bright side is: now I have some peppered Boursin in the fridge. Loosely based on Ina Garten's recipe, with a little olive oil added in, I kept it simple this time since I'm taking it to a picnic event tomorrow, Jazz at the Sculpture Garden, and I'm not sure which twists people will and won't go for. 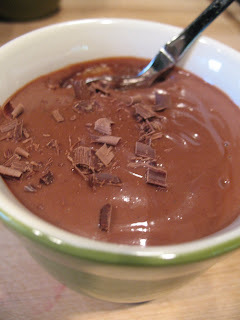 A coworker sent me a link to this recipe from Cooking Light... she picked a winner! I know I've made a plethora of asparagus recipes recently, at least one a week for the last month, but I think about it like this: I eat asparagus once a week for approximately one month out of the year when it's in season, but then I don't get to eat it again for a year! So I am enjoying it and trying to keep it interesting by trying new recipes each time. Randy from Star Hollow Farm has already warned me that this coming Saturday is the last time I'm getting asparagus in my CSA box this year. I had the dill left over from Amy and Tim's Peace Corps reunion "horovatz" (BBQ). So, back to the recipe: I halved the recipe since Chuck and Tim were eating elsewhere (and because I only had half of the 1 pound bag of shrimp in the freezer), but the halving wasn't exact. I messed with the ratios a little bit. I did half the rice, stock, water, onion, garlic and shrimp, but added approximately the full amount of asparagus, dill, lemon juice and cheese. Good idea. The extra asparagus was a bonus as far as texture and color goes, the extra flavor from the dill and lemon was key and the additional cheese added to the creaminess, as it basically melted when I stirred it in the rice. As Jennifer is known to say: "It was really yummy!" This dish was a hybrid of a couple recipes I found online, plus a few modifications of my own based on what I had in the fridge, what needed to be used, and general spaciness/laziness after a busy weekend. The Martha Stewart Recipe looked good, but almost too simple. This other recipe included mushrooms, which I wanted to use up, but I liked the idea of Gruyere more than creme fraiche (and didn't want to pre-cook the veggies). So, I ultimately used packaged puff pastry, rolled it out on a baking sheet, put a super (super!) 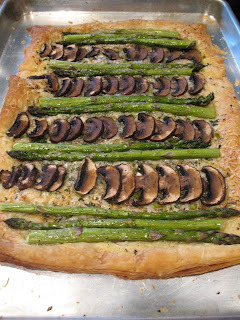 thin layer of Dijon mustard on it, sprinkled it with shredded gruyere, a thinly sliced green onion, a little bit of minced fresh thyme, parsley and rosemary, S&P, and then laid out raw asparagus and mushrooms in an artful way. Brushed the top with olive oil and more S&P and stuck it in a 400 degree oven for about 20 minutes. The only thing I would do differently next time is grease the baking sheet a wee bit. Tasty and definitely cool looking!! 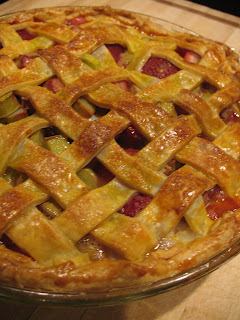 This recipe is definitely a keeper and a great way to eat rhubarb that doesn't involve strawberries and a ton of sugar. The original recipe I was working with used pork tenderloins, but I didn't have those on hand, so I figured chicken thighs (yes, the ones in the 6-packs from Costco) would be a good substitute. Good guess! Slightly sweet, slightly tart, totally moist and tender. 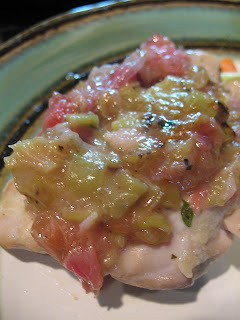 The chicken and compote cook in little foil packets on a hot grill, but I bet you could do them in a hot oven, too, in parchment and/or foil. "Tim, can you preheat the oven and pull out the pie plate, please?" "Ehhhhhhhh... when you said you'd make me a pie, I didn't think I'd have to be involved!!!" Used another Smitten Kitchen recipe, although I omitted the cinnamon and substituted some lemon juice instead since I have a weird thing against cinnamon in sweet dishes. I only like it in savory dishes like chili, etc. Pretty tasty, although a little watery as the recipe noted. Made this recipe tonight because I had all of the ingredients on hand and had seen it in a couple places: Bon Appetit and Smitten Kitchen. 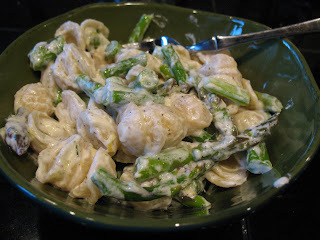 The recipe was super easy (asparagus and pasta cook in the same water, sauce is no-cook), and super tasty. The lemon really cuts through the richness of the goat cheese. The only changes I made were to use orecchiette (the little ears) instead of spiral pasta and didn't use a full pound of it. Also, I added about 1 lemon's worth of juice. Didn't end up needing the pasta water. 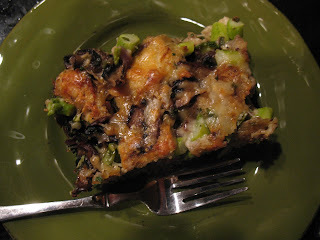 At the recommendation of the Washington Post Food Section bloggers at "All We Can Eat," I tried this bread pudding recipe to use up the crimini mushrooms and asparagus from my CSA. 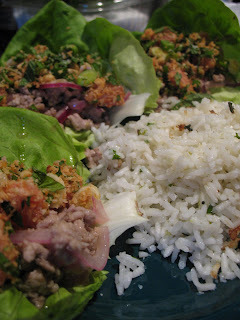 The recipe is based on a recipe that Barbara Kingsolver included in her locavore's diary, "Animal, Vegetable, Miracle." Pretty good! 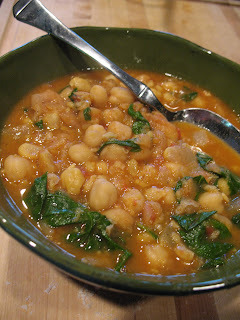 Made this soup tonight with onion and spinach from the CSA, and cans of chickpeas we bought at Costco. The spice in this was great... I would definitely make it again. 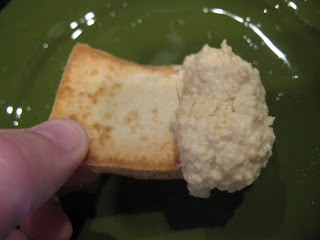 It's really hearty, really inexpensive, really easy, and also pretty healthy. The changes I made to the recipe were to include adding smoked and regular paprika instead of sweet, since that's what I had on hand, and I just plain forgot to add the sugar, but didn't miss it. 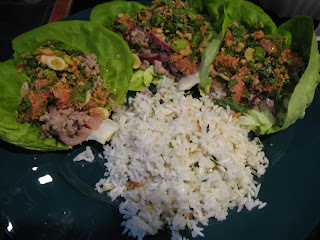 Mmm... these were really good: pork lettuce wraps with grapefruit. I used a recipe that caught my eye in my Food Network Magazine, although I used ground turkey thighs rather than the ground pork because that was all I could find on the way home from work. The Bibb lettuce and the scallions are from the CSA. I would definitely make these again! The coconut lime rice was somewhat of a disappointment... not as flavorful as I hoped, and the rice didn't get quite cooked all the way for some reason. Oh well. I'll try a different recipe next time, perhaps. And I'll try the coconut popsicles from the magazine, too! First asparagus of the season combined with the last of the parsnips (hoorah!). 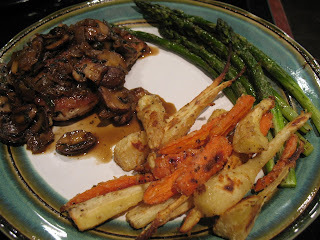 Served with the white wine chicken and mushrooms recipe that I've made before, using the thyme and mushrooms from the CSA and the tarragon off the roof. 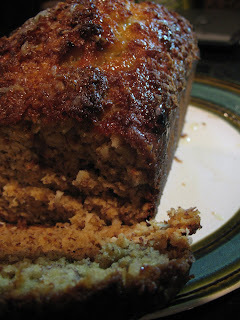 Made this coconut banana bread with lime glaze this weekend in order to use up some old brown bananas and some of the many limes that Jennifer brought from the tree in her San Diego yard. Pretty tasty! !